Harry Sydney was one of the earliest Music Hall comic stars, performing all over the country. He was also a song writer and eventually became manager of some of the most well known theatres such as the 'Oxford Music Hall', 'Collins's' and 'The Philharmonic'. People from the country were often portrayed as 'innocents' with few worries, and these songs were especially popular with audiences from cities who could laugh at these characters. 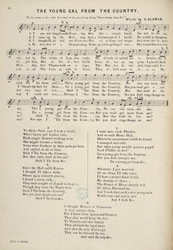 They were read in a much more positive way by local audiences, pleased by the idea that the 'hero' of the provincial song usually got the last laugh.